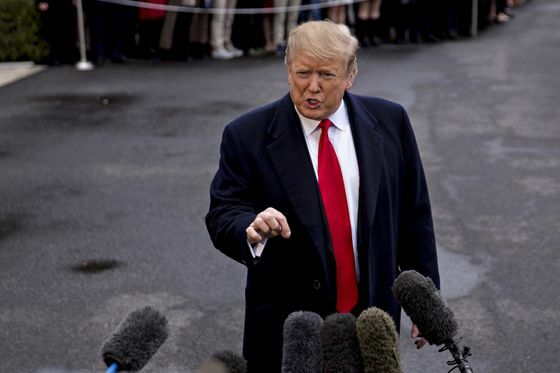 (Bloomberg) -- As Washington waited for Special Counsel Robert Mueller’s report to land, President Donald Trump delivered a week of surprises that caught even his own staff off guard, and finally ended in the most typical of settings: on the golf course. Bouncing from one headline to the next, Trump picked fights with a dead senator and a top aide’s husband. He reversed longstanding U.S. policy to recognize Israeli sovereignty over the Golan Heights. He showed off misleading maps of the destruction of Islamic State -- at one point, upside down. He announced he’d nominate a political supporter to the Federal Reserve Board on Friday, then issued a cryptic tweet on North Korean sanctions suggesting he’d kneecapped his national security apparatus to curry favor with the country’s leader, Kim Jong Un. A summit with Caribbean leaders at Trump’s Mar-a-Lago resort in Palm Beach, Florida, aimed at increasing pressure on Venezuela was utterly overshadowed. Trump has a habit of announcing snap decisions -- often on Twitter, frequently without consulting aides -- to divert news coverage from issues he doesn’t like or turn the media spotlight back toward himself. But this week, the suspense was palpable in the corridors of the West Wing, along Trump’s motorcade routes and across the Twitterverse. Mueller delivered a final report on his 22-month investigation of Russian interference in the 2016 presidential election and any ties to Trump or his associates and family to Attorney General William Barr late Friday. Barr told Congress in a letter that Mueller was never directed by Trump administration officials to take any specific actions, but otherwise said he would take some time to review the report. In the hours immediately after the report landed, the president neither lashed out nor gloated. Trump made no mention of Mueller during brief remarks when he stopped by a local Republican Party fundraiser being held at Mar-a-Lago Friday night, according to video accounts of the event. Nor did he tweet about Mueller overnight. He headed to the nearby Trump International Golf Club around 9 a.m. on Saturday morning, as is his routine on any weekend he stays in Palm Beach. The White House, which doesn’t always confirm Trump’s golf games, said the president played in a foursome but didn’t identify his partners. Earlier this month Trump teed it up on consecutive days with Lexi Thompson, the highest ranked U.S. woman golfer, and world number one Dustin Johnson, who both live nearby. Trump returned to Mar-a-Lago after 2 p.m.
Trump’s acting chief of staff, Mick Mulvaney, and White House counsel Pat Cipollone and lawyer Emmet Flood, were staying on in Florida, although it was unclear when or how Trump was being briefed. Mueller’s findings carry potentially massive legal and political consequences for Trump’s 2020 re-election bid, even though the full report may never be made public. Meanwhile, the president has been itching to make news on practically any other subject. For the first time, he publicly attacked George Conway, a Republican lawyer critical of Trump who happens to be married to White House senior adviser Kellyanne Conway. Trump seemed to delight in shocking establishment Republicans -- even stepping on his own positive jobs message on a trip to Ohio -- with a fresh campaign to turn public opinion against Senator John McCain, a Vietnam war hero and Trump antagonist who died eight months ago. Republican senators belatedly rose to their deceased colleague’s defense with a smattering of rebukes. Then on Thursday, Trump announced -- again on Twitter -- that he supported scrapping decades of U.S. policy and recognizing the Golan Heights, captured from Syria by Israel in their 1967 war, the Jewish State’s territory. It’s a huge boost for the country’s embattled Prime Minister Benjamin Netanyahu ahead of parliamentary elections and may boost Trump’s standing with evangelicals and some pro-Israel Jewish voters. The announcement blindsided State Department officials by surprise, further alienated liberals and Jewish voters supportive of a two-state peace plan with the Palestinians, and deeply complicated Trump’s Mideast peace bid. On Friday, still awaiting a Mueller report, White House Press secretary Sarah Sanders told reporters flying to Florida with Trump aboard Air Force One that the Pentagon had just declared the Islamic State’s territorial caliphate in Syria and Iraq 100 percent eliminated. Acting Defense Secretary Patrick Shanahan briefed Trump during the flight, she said. Moments later, flanked by supporters on the airport tarmac, Trump held up two maps. One showed in red the territory Islamic State held across Iraq and Syria on his election night, Trump said. The other, entirely white, showed the same land now. However, a closer examination of the red map showed that it reflected the extent of ISIS-controlled territory a full two years before Trump’s election, in 2014. That was before the Obama administration launched the U.S. proxy war against the militants Trump has continued that led to their defeat. U.S. progress against Islamic State would look less dramatic under Trump had he actually used a map from November 2016. Asked about the discrepancy, White House officials did not offer an explanation. Trump then announced he would nominate Stephen Moore, a visiting fellow at the Heritage Foundation and a political loyalist of the president, to the Fed board -- a move seen as escalating a fight with the central bank. But asked if he would also nominate Shanahan, the longest-serving acting Pentagon chief ever, for Senate confirmation, Trump demurred -- with the Pentagon chief standing next to him.